Appearing in Group of Seven paintings of Algonquin Park, Lake Superior and Georgian Bay, the pine tree has become an icon of Canadian landscape art. 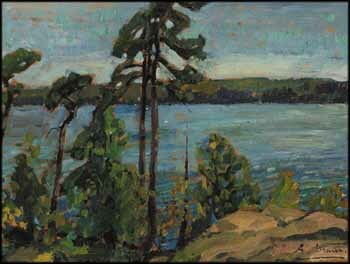 Arthur Lismer painted in all these locations, but the one he had the greatest passion for was Georgian Bay. During the 1920s he traveled there a number of times on summer sketching trips. He spoke of his admiration of its "radiant air...the endless expanse of turbulent water and sky, the magnificent sturdy stance of pine trees pitted against the wind." Often depicted in windblown disarray by Lismer, here the pines are still and stately, silhouetted against rich blue water and sky. Lismer's expressionist brushwork and bold dabs of colour accents convey the aliveness of the landscape in its rocky headlands, rippling water and changing sky. His use of the exposed panel gives warmth to the cool palette and emphasizes the work's painterly qualities. Fresh and vigorous, full of the atmosphere absorbed while painting on the spot, The Silent Pines is an outstanding Group of Seven–period Lismer.